The United States Congress designated the Great Bear Wilderness (map) in 1978 and it now has a total of 286,659 acres. All of this wilderness is located in Montana and is managed by the Forest Service. The Great Bear Wilderness is bordered by the Bob Marshall Wilderness to the south. The Bob Marshall Wilderness Complex Located in Northwestern Montana on both sides of the Continental Divide, this large complex includes three Wilderness areas: the Great Bear, the Scapegoat, and the Bob Marshall Wilderness. Together the Bob Marshall Wilderness Complex makes up an area of more than 1.5 million acres, the third largest in the lower 48 states. Grizzly bear, lynx, wolverine, deer, elk, gray wolf, moose, black bear, mountain lion, mountain goat, and mountain sheep roam about these rugged ridge tops, gently sloping alpine meadows, thickly forested river bottoms and open grass parks. Across this continuous landscape over 1700 miles of trail provide challenges and experiences to satisfy visitors with a wide range of skills. The Great Bear Wilderness was congressionally designated as a Wilderness area in 1978 with a total of 286,700 acres. This wilderness is located on the western side of the Continental Divide entirely within the Flathead National Forest (Hungry Horse and Spotted Bear Ranger Districts). It forms a critical ecological link with Glacier National Park located just across U.S. Highway 2 to the north. The Great Bear completes the habitat protection for the most significant grizzly bear range in the lower 48 states. The Great Bear Wilderness extends roughly 36 miles and at its widest point is about 34 miles across. 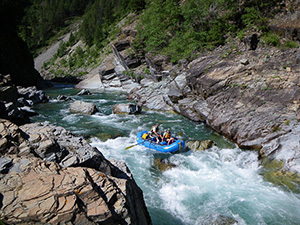 The Middle Fork Flathead River rises in the Great Bear Wilderness and runs wild and scenic through the area for about 50 miles, raging below cliff faces and over boulder strewn rapids in what some refer to as Montana's wildest waterway. The wilderness area also contains approximately 310 miles of system trails. Elevations range from 4000 feet on the Middle Fork to 8,700 feet on Great Northern Mountain. Located in the Great Bear Wilderness, Schafer Meadows is the location of the only open airstrip within the BMWC. It provides a unique primary access point for the Schafer area as well as the Middle Fork of the Flathead River. The airstrip pre-dates the wilderness designation for the Great Bear and was specified as an "inclusion". Planning to Visit the Great Bear Wilderness? How to follow the seven standard Leave No Trace principles differs in different parts of the country (desert vs. Rocky Mountains). Click on any of the principles listed below to learn more about how they apply in the Great Bear Wilderness.